He landed on just the right building. It's not everyday you go into work and find a bat on the roof. 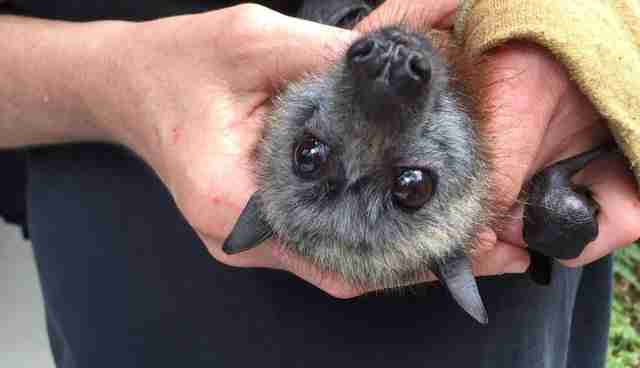 Workers inside an office building in Sydney, Australia, in late 2015 peered out the window and spotted the bat lying across the roof's metal awning. 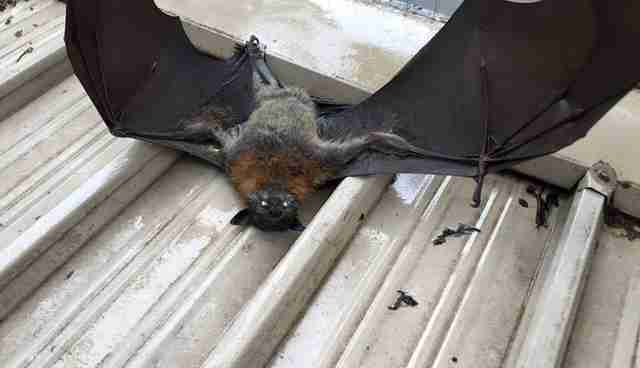 But this bat was in bad shape - he wasn't moving, not even when birds swooped and began to peck at him. Luckily for the bat, the office workers were employees of the World Animal Protection Society (WAPS). 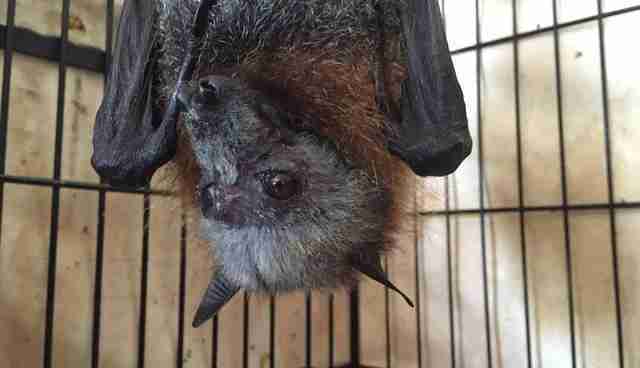 As much as they wanted to rescue the bat themselves, they knew it could only be someone licensed and trained to rescue bats and vaccinated against Australian bat lyssavirus (a rare disease similar to rabies). So they called Sydney Wildlife, an organization that rescues and rehabilitates wildlife in the Sydney region. Sarah Curran, a wildlife rehabilitator for Sydney Wildlife, was studying for her final university exams when she got the phone call. She dropped everything and rushed into the city. "I was advised that maintenance would meet with me to let me on to the roof," Curran told The Dodo. "However, when I got there, maintenance was nowhere to be seen. So a group of very concerned WAPS employees took to the main street with me in search of a workman willing to lend us a ladder." It had stormed the last 24 hours, and Curran suspected that the bat - whom she named Lenny - had gotten tossed and tumbled in the wind. He'd probably hit a wall at high speed, and dropped onto the roof. Whatever happened, when Curran reached him, she saw that Lenny needed help - quickly. "I took him straight to the vet for assessment," Curran said. "Secured him in a wire-top carry cage, with a fleece sling so that he could rest, kind of like a human patient would lie down in a trolley on the way to the hospital in an ambulance." The vet shared some bad news - Lenny had a traumatic brain injury due to a high-impact collision. 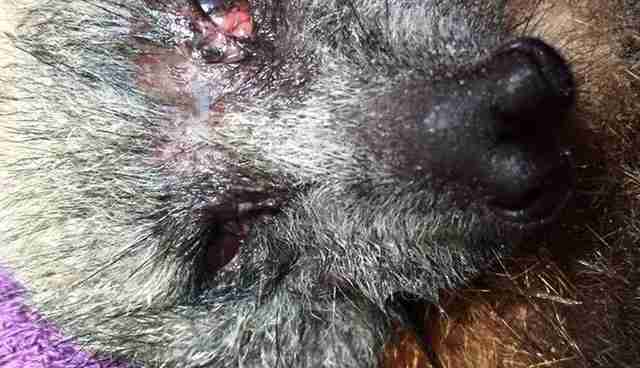 The impact had jolted Lenny's brain around in his skull, causing extensive bruising and swelling. Lenny also exhibited neurological symptoms such as tremors, rigidity and difficulty with coordination. Lenny's condition was "touch and go," the vet said, but thought it was "worth a shot" to help him get better. This was all the encouragement Curran needed. She took Lenny back to the rehabilitation center inside her home and worked hard to keep his wounds clean and manage his pain. Lenny had to spend several weeks in a hospital cage, which is only large enough for him to stretch his wings, but not fly around. Curran worried he'd lose his ability to fly. When Curran eventually took Lenny into a larger flight facility, she got a big surprise - Lenny hadn't lost his ability to fly. In fact, he took off straightaway! "I felt rather proud," Curran said. "Possibly a tear of joy out of the corner of my eye!" Lenny stayed in the flight facility for a few more weeks so he could build up his strength. Then Curran released him into a national park in northern Sydney. "I try to keep a slight emotional barrier between myself and the animals, out of respect for what is wild," said Curran. "This isn't always possible, but I think it helps me to treat my bat patients. It's my privilege to be able to work with them, to allow them a second chance." 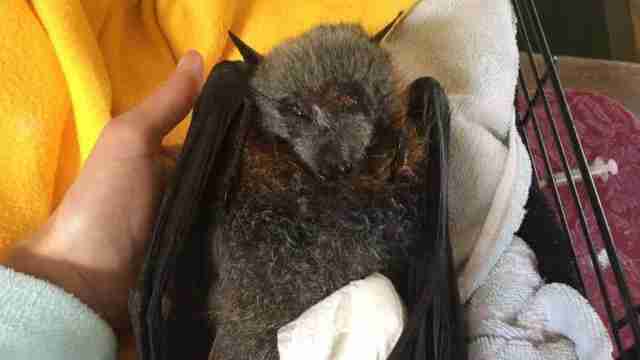 Each year, countless bats like Lenny are injured by contact with manmade objects. If you'd like to help save them, you can make a donation to Sydney Wildlife here.